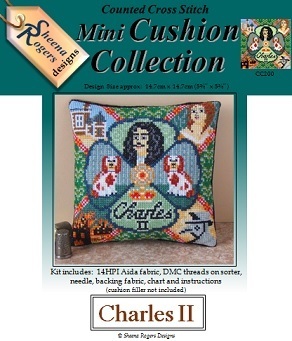 He was known as the Merry Monarch for his flamboyance and courtly excess and now you can stitch the King himself, Charles II, surrounded by the story of his life. He reigned over England, Ireland and Scotland from 1660 until his death in 1685 and this design features motifs of the Royal Observatory, Greenwich (which he founded), his long-time mistress Nell Gwyn and his beloved Spaniels, named after King Charles. Also included are the Great Fire of London and the Great Plague of London (represented by a Doctor in his protective 'beak' mask), both of which occurred during the reign of Charles II. This mini cushion cross stitch kit includes: 14HPI white aida fabric, ready-sorted DMC Stranded Cotton Threads on a numbered card sorter, needle, backing fabric, b&w symbol chart and full instructions (cushion filler not included). Only whole cross stitch is required with a little backstitching needed for the finer details.